Beneficial Insects in the Garden - Kalleco Nursery Corp.
It’s that time of year again: aphids, sawfly larvae, scale insects, and other bugs are appearing all over your garden. 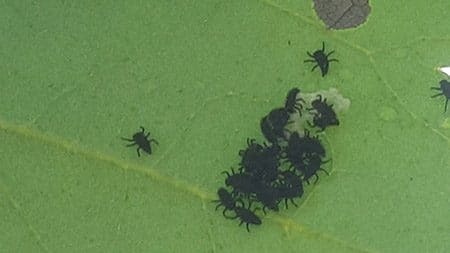 But along with these pests come beneficial garden insects that help to control – and sometimes take care of entirely – the populations of garden pests. So hold off on the neem oil or other insecticidal soaps until you know what you’re looking at! Adult ladybugs, otherwise known as ladybird beetles, are known for eating aphids. What some people might not know is that the immature ladybug larvae are even better at taking care of them. When ladybugs first hatch (out of their mustard-yellow football-shaped eggs), they look like and are about the size of a single body segment of a common ant. Right away, they begin eating aphids to support their rapid growth. Keep an eye out for their next developmental stage – they’ll have orange bristles on their sides and back. Not long after that, they’ll transform into the red spotted beetle we’re all familiar with. At all stages, these beetles will keep the harmful aphid population on your plants under control. Another beneficial insect to have in your yard are lacewings. 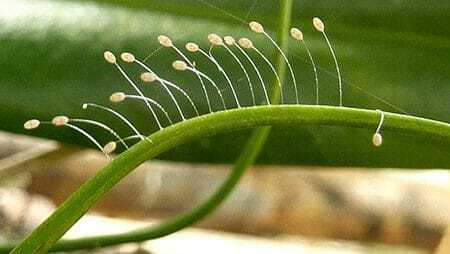 Their larvae eat aphids and other soft-bodied insects, as well as other insect eggs. They are mostly nocturnal but you might occasionally see them during the day. 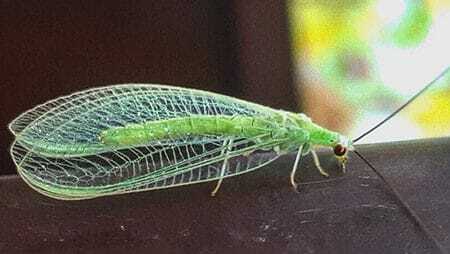 The adults have bright green bodies about ¾ of an inch long and two sets of clear wings with green veins that they hold against their bodies like a tent. Lacewings also have large bronze colored eyes on either side of their head and antennae about the same length of their bodies. 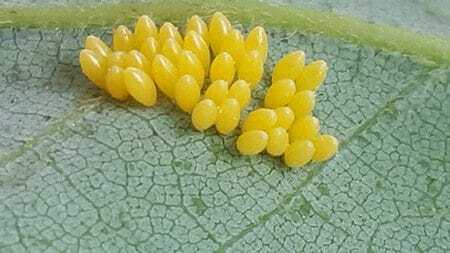 Keep an eye out for their unusual eggs, resembling small white balls hanging off the end of a thread that attached to the leaves or stems of plants. The lacewing larvae look similar to the ladybug larvae except they are more of a brown color with white spots near their leg joints. They also have a much larger set of jaws. Lacewing larvae can eat well over a hundred aphids! Protect your helpful little lacewings by keeping an eye out for ants, who love to eat lacewing eggs. The third insect ally to be on the lookout for is the praying mantis. These guys eat a wide variety of insects and other creatures in the garden. In the past couple of weeks, they’ve begun hatching out of the egg casings that they have been in all summer. Look for these casings on tall grasses, the inner branches of deciduous shrubs, and conifer branches. The egg casings almost look globs of expanding foam insulation, about an inch or so in length and width. Inside are hundreds of tiny mantises ready to feast! So leave those casings be, and reap the benefits when these long green insects emerge. 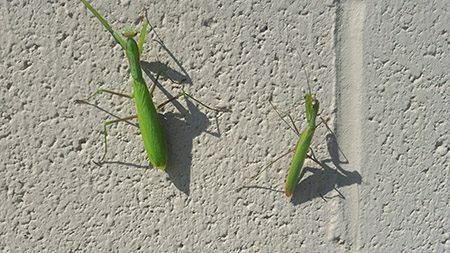 Adult Praying Mantises, female (left) and male (right). Of course, not every many-legged creature coming out this time of year is your friend. Japanese Beetles will soon be plaguing your trees and shrubs, but you can take some steps to mitigate that. If you have honey locust trees, you’ll want to keep an eye out for leafhoppers. Luckily, supporting your natural ladybug population can help keep these pests at bay. And finally, be on the lookout for spider mites, who are probably on their third generation since the weather warmed up. They’re another favorite snack for lacewings and ladybugs!